Ocean Energy USA LLC is part of the Ocean Energy Group and is actively pursuing opportunities in the US market. For the United States, the potential Marine Hydro Kinetic (MHK) resource, which is predominantly waves, is estimated between 13 and 19 percent of current electricity demand. The US Department of Energy (DOE) estimates that Oregon, Washington and California can meet up to twenty percent of their electricity requirements from wave energy. Alaska and Hawaii could meet nearly their entire power requirement from MHK technologies. “Wave energy technology is still very much at the research, development and deployment stages and the Memorandum signed will result in increased co-operation between Ireland and the US. Collaboration under this Memorandum will involve research co-operation in the field of wave and tidal energy, involving marine and hydrokinetic energy technologies. Among the Irish bodies that may take part in this research cooperation are the Sustainable Energy Authority of Ireland, which has a dedicated Ocean Energy Research Unit providing research funding and other supports, the Marine Institute, the Irish Maritime and Energy Resource Cluster (IMERC) and the Hydraulics and Maritime Research Centre, University College Cork. 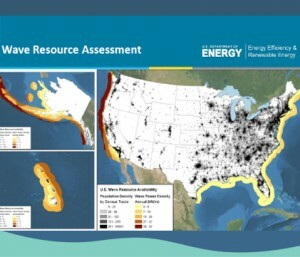 Possible participants from the US side are National Energy Laboratories and National Marine Renewable Energy Centers such as the National Renewable Energy Laboratory, Sandia National Laboratories, the Northwest National Marine Renewable Energy Center, the National Marine Renewable Energy Center of Hawaii, and the Foundation for Ocean Renewables.